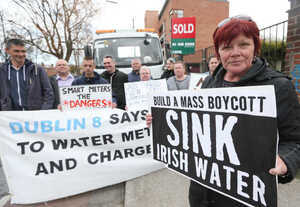 Joan Collins, Independendents4change TD for Dublin South Central, is to move a billl calling for a referendum to prevent any future privatisation of water services when the Dail reconvenes later this month.. The bill is called the Thirty-fifth Amendment of the Constitution (Water in Public Ownership) (No. 2) Bill 2016. ‘The Government shall be collectively responsible for the protection, management and maintenance of the public water system. The Government shall ensure in the public interest that this resource remains in public ownership and management’. ”I am very pleased to be able to move this bill with the support of my Indenpendents4Change colleagues, Sinn Fein, AAA/PBP and in fact all 39 TDs who stood in the general elections on the Right2Change policy programme. “This bill will pass if it is supported by Fianna Fail who fought the election on an anti -water charges claim. We will now see how serious their claim was. Will they support the bill or will they hide behind the fig leaf of the commission on water charges? Posted in Misc and tagged Privatisation, water at 3:04 pm on September 13, 2016 by Broadsheet. I’ll be there, Joan. We have got to win this one, or we are lost. Is this bill in response to FF saying that they are going to put forward a bill a abolish it? The fight to say who abolished water charges. FF voted against bills similar to this in the past. 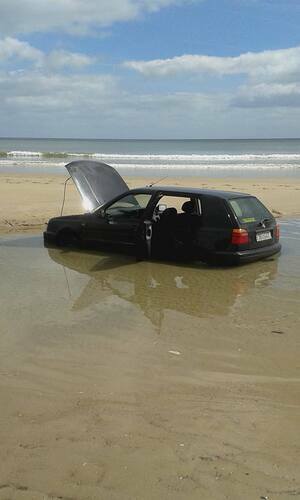 FF smell an election coming and will promise anything to get in power and renege on their promises. They have form already. Or they know a vote winner when they see it, will back the government then and force through the abolition themselves. Yes, “general taxation” will pay for our water and the investment in our water – that magical pot of money from nowhere which probably means higher taxes on incomes from those of us who actually pay income tax. I’m with the Greens on this. No one will care about water or water conservation until they actually pay for it – just like waste and waste recycling. What nonsense. People are, and have been, very enthusiastic about recycling once the facilities to recycle came into being, despite the fact that we now offer our glass and aluminium recyclables to companies free of charge, instead of receiving a rebate per item as was the practice in yesteryear, and as is still practiced in Germany. in case you have been under a rock….you now pay to give them your recyclables..
Not around my area. You just leave them at the corner of the lane way at the bottom of my road and every few weeks they magically disappear and the whole process can begin again. It also works for non-recyclable rubbish as well. How about a bill to stop nepotism instead Joan, Whats that Joan its not nepotism when you do it. She’s a great example of idiots voting for any td that jumps on the popular bandwagon of the time. Not if you bring your glass and aluminium cans to a bottle bank, Jimmy – I haven’t been under any rock. And why is water conversation so important when 50% of all produced is leaked through pipes? Or is it just easier to push the responsibility down onto the ‘small’ man? That was to Joe Small. It has only become important since it was realised that there were huge profits for private companies to be made from generating sudden concerns and panics about water quality and water ” wastage”.